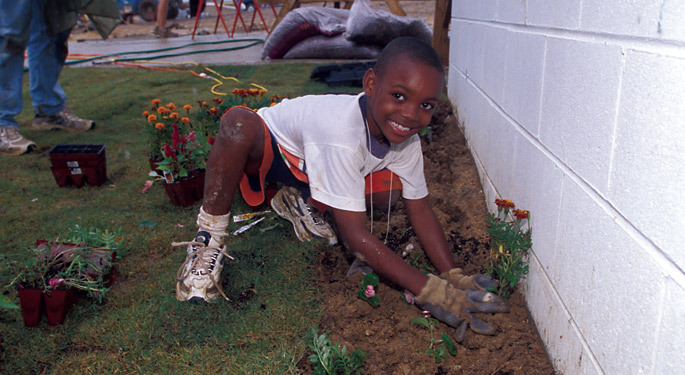 The Habitat for Humanity Garden welcomes volunteers of all ages and descriptions who like to get their hands dirty and watch things grow. Habitat landscapes every home it builds or remodels. Prince of Peace Lutheran Church in Portage hosts the garden, which is easily accessible to volunteers, Habitat families, and donors of bedding plants. The garden receives healthy donated plants year-round. The garden system nearly runs itself—open access, all needed tools onsite and plenty of signs so donors can transplant donated plants in the correct raised bed, even if no one else is around. Come and play in the garden! Dig, work, weed, water, trim, and watch the magic of the Habitat garden change through the seasons. Your efforts will make our next Habitat home a beautiful place for our next partner family. You can bring your plant to the garden and transplant it in yourself anytime! Please label a stick and identify your plant in the bed where you placed it.